First Lt. Benjamin Cross, 26 and a Bethel native, was an aviator aboard the tilt-rotor aircraft. 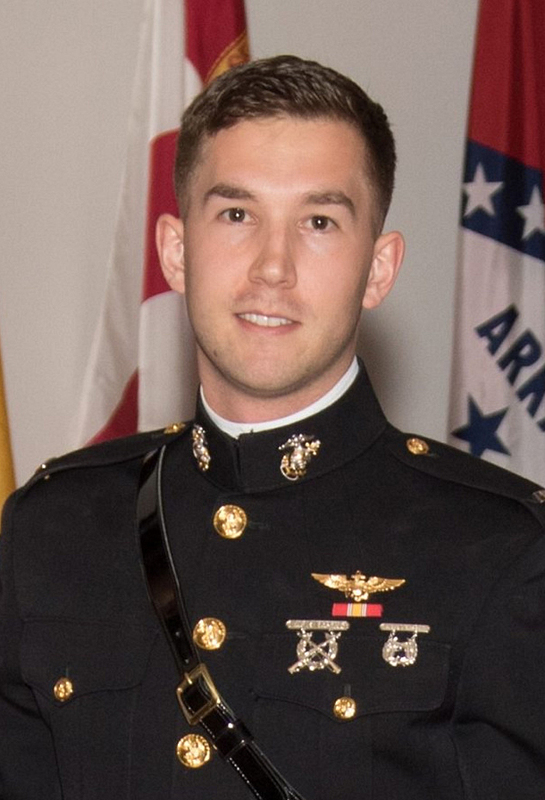 A Maine native was one of three Marines killed when their MV-22 Osprey crashed into the Coral Sea while trying to land on a Navy ship off the east coast of Australia on Saturday. First Lt. Benjamin Robert Cross, 26, whose family lives in Bethel, had been stationed on the Japanese island of Okinawa for the past year and was training in Australia for the last three months, family members said. Cross’ family learned that he was missing Saturday morning and his parents, Robert and Valerie Cross, were told early Sunday that their son’s status had been changed from missing to deceased. Cross, who attended the Virginia Military Institute on a full scholarship, was a Marine aviator who loved to fly, his family said Sunday. “He was so smart and just a great guy,” said Ryan Cross, his older brother. Ryan Cross said the family did not know who was piloting the Osprey when it crashed. The Osprey had launched from the USS Bonhomme Richard and was conducting regularly scheduled operations when it crashed about 4 p.m. local time, the Marine base at Camp Butler in Japan said in a statement Saturday. The ship’s small boats and aircraft immediately responded in the search-and-rescue efforts, rescuing 23 of the 26 personnel aboard the aircraft, the statement said. 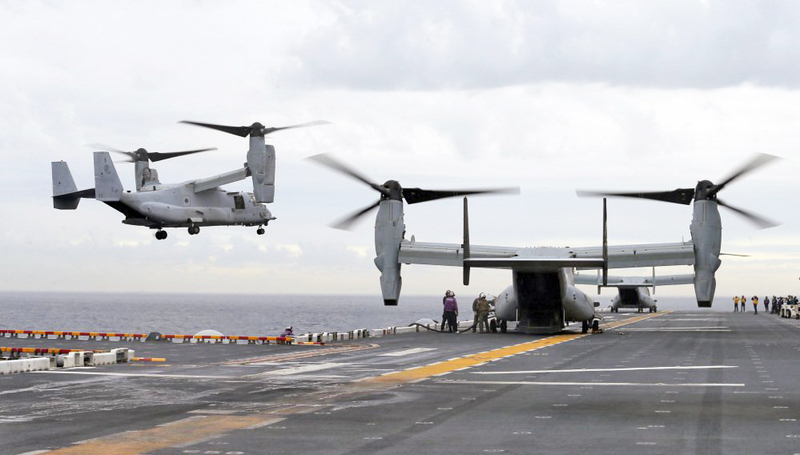 The V-22 Osprey – called the MV-22 by the Marines – can lift off like a helicopter and rotate its propellers to fly like an airplane. During its development by Bell Helicopter and Boeing, the aircraft was involved in four crashes that caused 30 deaths. Since coming into service in 2007, Ospreys have been involved in five more crashes resulting in nine more fatalities, according to Fortune magazine. Richard Whittle, a journalist, author of several books and an expert on the Osprey, said the aircraft has an undeserved reputation as a death trap when in fact it has a relatively safe record compared with other military aircraft, especially helicopters. The Osprey that crashed was assigned to the Marine Medium Tiltrotor Squadron 265 and the 31st Marine Expeditionary Unit based out of Okinawa. Cross graduated in 2009 from Telstar Regional High School in Bethel, a town of about 2,600 in western Oxford County. He was frequently named to the honor roll, and during his senior year was named Mr. Telstar and received numerous scholarships, including a President’s Award for Academic Excellence and a U.S. Marine Corps NROTC scholarship. “I remember Ben as being a solid, high-performing scholar and athlete. His ROTC scholarship speaks to the kind of leader he was,” said David Murphy, school superintendent of SAD 44, which includes Bethel. Cross graduated from the Virginia Military Institute in 2013 and was commissioned into the Marines. He had been in Japan since October. Australian Defense Minister Marise Payne said Saturday’s crash took place near Shoalwater Bay off Queensland state, The Associated Press reported. The search-and-rescue operations by the U.S. Navy and Marine Corps were suspended Sunday and shifted to recovery efforts, the Marines said in a statement. “The transition comes after teams led continuous sustained search efforts supported by aircraft and ships,” the statement said. “As the sea state permits, recovery efforts will be conducted to further search, assess and survey the area, in coordination and with assistance from the Australian Defence Force. The Marines have completed in-person notification of the families of the three missing Marines, a Marine spokesman said Sunday night, but would not immediately release their names publicly. A U.S. Marine MV-22B Osprey aircraft lands on the deck of the USS Bonhomme Richard amphibious assault ship off the coast of Sydney during joint military exercises between the United States and Australia. The Osprey’s development was nearly derailed by the death of 23 Marines during flight testing in 2000, but its speed and range have made it very popular in recent years, Reuters reported. In 2015, an Osprey crashed during a training exercise in Hawaii, killing two Marines. Last December, an Osprey crash-landed off Japan’s southern island of Okinawa. Its five crew members were rescued. And in January, three U.S. soldiers were injured in the “hard landing” of an Osprey in Yemen, the AP reported. The White House said that President Trump was briefed on the matter by his chief of staff, John Kelly. The Courier-Mail, a newspaper in Brisbane, Australia, reported Cross’ Marine unit had been training in the area for two weeks following Exercise Talisman Sabre, a biennial military exercise that trains Australian and U.S. forces to plan and conduct combined task force operations to improve combat readiness and coordination. The MV-22 Osprey, nicknamed the “widow maker” by some critics, was flying from the USS Bonhomme Richard to the transport deck of the USS Green Bay. The newspaper said the helicopter slammed into the Green Bay and then slid into the water about 25 nautical miles off the coast between Cape Manifold and Cape Clinton. The water was about 160 feet deep and weather conditions were calm, the Courier-Mail reported. Cross played baseball and soccer in high school. The Cross brothers were “well-liked and good representatives of the school,” said Gail Wight, the athletic director at the school. News of Benjamin Cross’ death was slowly spreading at the Virginia Military Institute in Lexington on Sunday. Lt. Col. William F. Bither Sr. called Cross an outstanding cadet. “He was a guy I could always go to help out and assist with any cadet issue,” said Bither, who was the tactical officer for Company G, one of 10 military companies at the school. “He always went above and beyond what was required of him,” said. As the older brother, Ryan Cross graduated from Norwich University and went into the Army. Ryan Cross said his little brother wanted to be a little different. “He didn’t want to do exactly as I did,” Ryan Cross said. Ryan said his brother loved to fly and took lessons in high school. “He was proud of being a Marine and of the aircraft he flew,” Ryan Cross said. Cross said his brother was an introvert but had a lot of friends. “He had a great sense of humor and so many friends. Everybody loved him,” he said. Press Herald Staff Writer Gilliam Graham contributed to this report.